THE LAST NIGHT OF BALLYHOO opens Friday, January 25, 2018 and runs through Sunday, February 17th, 2018. Performances are Thursdays, Fridays and Saturdays at 8pm, and Sundays at 2:30 pm. 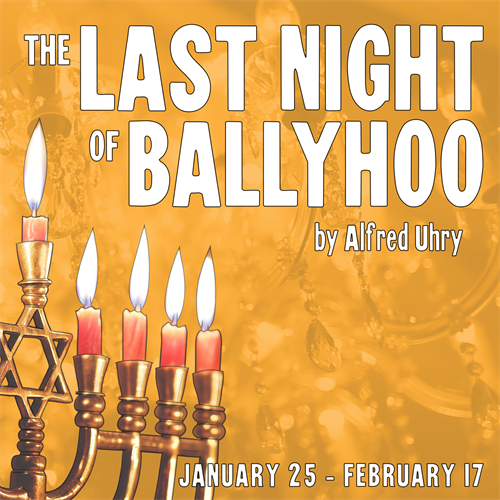 ATLANTA, GA – Dunwoody’s own professional theatre, STAGE DOOR PLAYERS, kicks off the 2019 leg of their Sapphire Season with a celebration of heritage in Alfred Uhry’s Pulitzer Prize and Tony Award award winning THE LAST NIGHT OF BALLYHOO. Originally designed as a series of vignettes based on Uhry’s childhood memories, this character study of intra-ethnic bias and identity was commissioned for the 1996 Summer Olympics, seeing its premiere at the Alliance Theatre. The show opens on Friday, January 25 and runs through Sunday, February 17, 2019. Performances are Thursdays, Fridays and Saturdays at 8pm, and Sundays at 2:30 pm. Single tickets are on sale now at the box office (770-396-1726), or online at www.stagedoorplayers.net. Tickets are $33; senior, student, and youth discounts are available. The story is set in the upper class German-Jewish community living in Atlanta, Georgia in December of 1939. Hitler has recently conquered Poland, Gone with the Wind is about to premiere, and Adolph Freitag and his family - who are so highly assimilated they have a Christmas tree in the front parlor – are looking forward to Ballyhoo, a lavish cotillion ball sponsored by their restrictive country club. When Joe Farkas, an attractive eligible bachelor prompts college student Sunny to examine her Jewish identity (or lack thereof), she begins to question the beliefs with which she has been raised.